The ability to hold collaborative conversations is crucial to supporting sustainable and diverse communities—whether physical or virtual—including effective real-time and ongoing conversations. Communities provide a sense of belonging through intimate connections and are an important sociological characteristic of human existence (Anderson, 2006). Communities are sustained through sharing, participation, and developing relationships. In order for these activities to occur, users need to participate in particular conversations that establish shared values and goals (Tunstall, 2008). Conversation assists individual and group negotiations that lead to shared understanding of why the community exists. Designers have a role to play in “raising or widening the circle of participation” which will foster the growth of any community (Putnam, 2001). Social interaction and participation not only builds relationships, but are also crucial to the survival of a community. Relationships are also developed through conversation. Therefore, communities that foster conversation are more likely to have a sense of solidarity and a stable foundation (Anderson, 2006). A designer interested in designing for conversation or communities will engage with uncertain and unstable factors. A designer interested in designing for conversation or communities will engage with uncertain and unstable factors. For example, when working with multiple participants, the conversation will always be unique to that specific grouping. Tools should be designed to accommodate varying scenarios with diverse participants. If conversations occur online, it is also likely that participants are geographically dispersed, which contributes to uncertainty and complexity when it comes to design. Users and participants are unpredictable in many ways; thus designers are responsible for anticipating the needs of community members. To understand how users interact with their digital communities, designers may turn to Elizabeth Tunstall, as well as Etienne Wenger, Nancy White and John D. Smith. People experience their communities through five dimensions: agency, life goals, historical consciousness, organizational structure, and relationships. 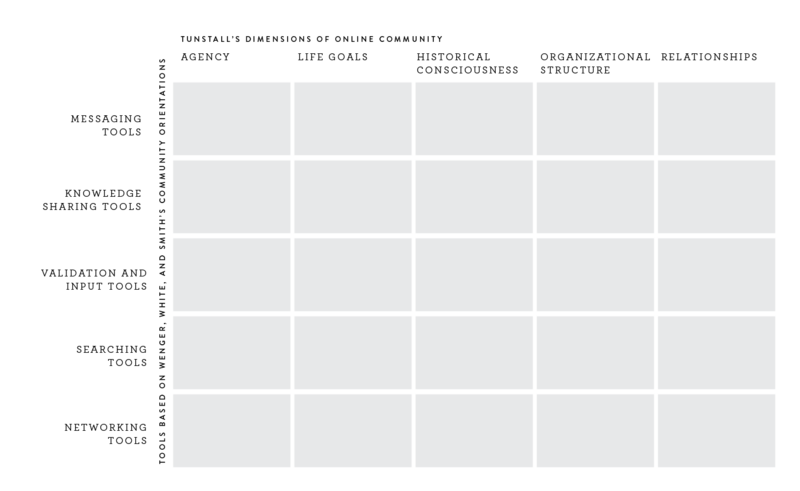 Elizabeth Tunstall, a design anthropologist, identified five aspects through which people experience their communities. Also referred to as “dimensions,” the five aspects serve as a means to support this investigation. Tunstall was inspired by Benedict Anderson’s concept of imagined communities, which addresses the impact of digital communities. According to Anderson, members may “live in the image of their communion” without knowing, meeting, or hearing their fellow-members. 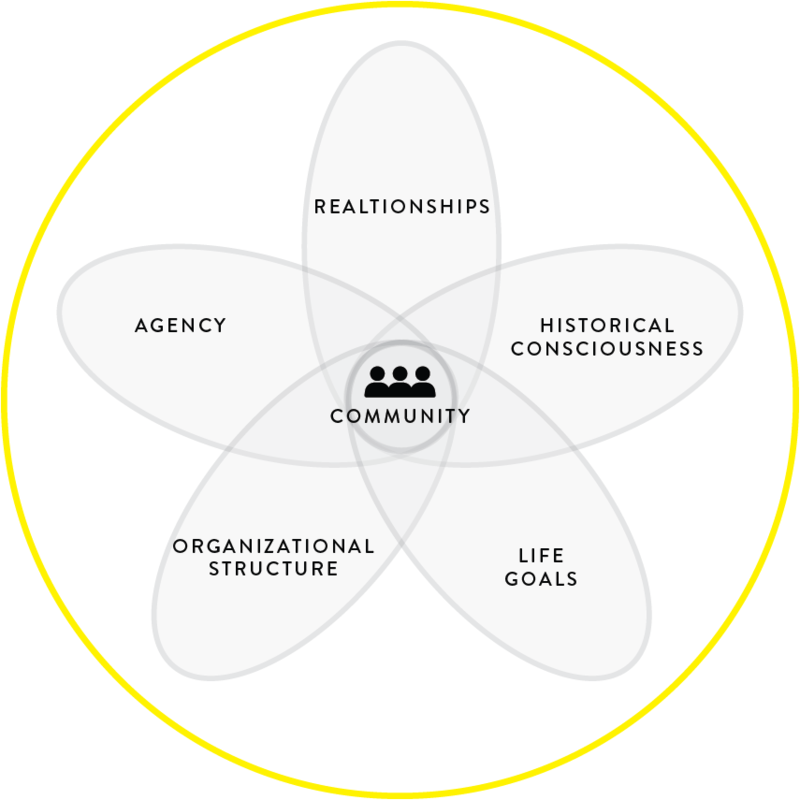 People experience their communities through five dimensions: agency, life goals, historical consciousness, organizational structure, and relationships. Agency refers to a person’s ability to control, or at least influence, decisions about the things that impact their communities and themselves. Life goals represent the opportunity for people to articulate what matters most to them. Historical consciousness is a person’s ability to openly express their history, where they come from, and who they are to find a sense of belonging in their community. Organizational structure speaks for itself as it provides people with an understanding of how they fit into and contribute to the greater whole or the community. Lastly, relationships are the basic units of the community and how people establish trust, understanding, and reliability (Figure A). Within online platforms, participants experience their community in many different ways and will engage in a variety of activities. 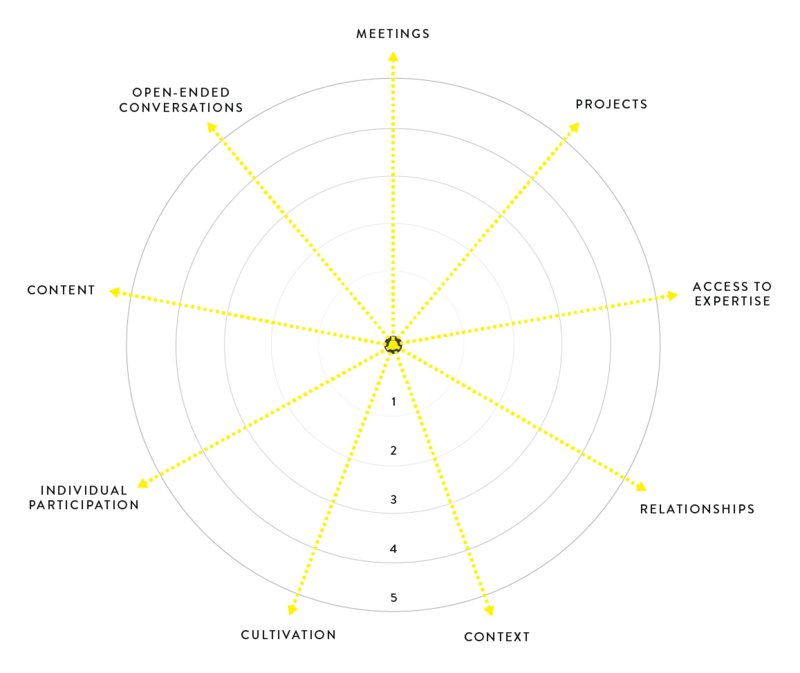 The activities are categorized into nine orientations: meetings, projects, access to expertise, relationships, context, cultivation, individual participation, content, and open-ended conversations (Figure B). Orientations are standard patterns of activities through which members experience the feeling of being a community. Tools serve as a means of support for the orientations and activities. Communities are flourishing when significant orientations complement aligning technologies. Orientations are not mutually exclusive, although communities may have primary or secondary orientations. The varying degrees of orientations contribute to the style, personality, and distinction of unique communities. As a community grows and evolves, it is likely that the orientations will change over time, and therefore so will the configuration of the supporting technologies (Wenger, White, & Smith, 2009). I devised the conceptual framework to guide the design and selection of tools for specific online communities. Using the methods mentioned above, I devised the conceptual framework to guide the design and selection of tools for specific online communities. Additionally, the framework provides the means to understand the implications of various tools. Users experience their community through five dimensions outlined by Tunstall (2008). To take part in experiences, they participate in a variety of activities (Wenger et al., 2009). When it comes to digital communities, specific tools facilitate various interactions. The tools needed by users are determined by the designer, but also by the type of activity that needs to occur, as well as the dimension that the activity supports. Wenger et al. (2009) categorized activities that occur within online communities into nine broad orientations that represent typical patterns of events and connections. Specific tools often found in digital platforms support the activities within each orientation. Activities and supporting tools are not unique to each orientation; rather they can be used across online platforms to accomplish a variety of tasks. In place of using the orientations to guide tool selection and design, I categorized the supporting tools into five buckets that represent a broad range of functions across all nine community orientations: Messaging tools, Knowledge Sharing tools, Validation and Input tools, Searching tools, and Networking tools. The conceptual framework created using Tunstall (2008) and Wenger et al. (2009) acknowledges that dimensions of a community have orientations of activities that implicate technology selection in the form of tools. The five tool buckets and Tunstall’s five dimensions of online communities form a matrix that enables a designer to consider features and functions that are needed to best support all aspects of experiencing an online community. This framework could be applied to the design of other online communities; however, the selection of tools should also consider the overall function and mission of the community in question. Overall, the conceptual framework created using Tunstall (2008) and Wenger et al. (2009) acknowledges that dimensions of a community have orientations of activities that implicate technology selection in the form of tools. Consequently, the tools support the dimensions of the community. The conceptual framework I developed is particularly important and relevant for designing digital habitats because it recognizes the many and diverse needs of online communities and their members, but also calls for intentional design that meets those needs (Figure C). Bree McMahon (MGD ’18) attended Carthage College in Kenosha, Wisconsin where she received a BA in graphic design. She spent five years as a professional graphic designer and freelancer, working with a number of start-ups to help launch brands and develop user and community-based systems. She just received her Masters of Graphic Design from NC State and has accepted a position as an Assistant Professor of Graphic Design at the University of Arkansas, where she will begin her career in academia this Fall (2018). She is an avid Redditor, self-proclaimed Settlers of Catan champion, and plagued by wanderlust. Tunstall, D. (2008). Unpublished workshop held at NCSU College of Design Department of Graphic Design. Wenger-Trayner, E., & Wenger-Trayner, B. (2015). Introduction to communities of practice: A brief overview of the concept and its uses. Grass Valley, CA: Wenger-Trayner. Retrieved from http://wengertrayner.com/introduction-tocommunities-of-practice/.